Although not all Christians celebrate Christmas Day on December 25 (some still use the Julian Calendar date corresponding to January 7), as we are, in either case, a few days away from Christmas this seemed an appropriate time to examine a few ancient coins on our website that carry early Christian symbols, all created after the Roman Empire had adopted Christianity as the state religion. 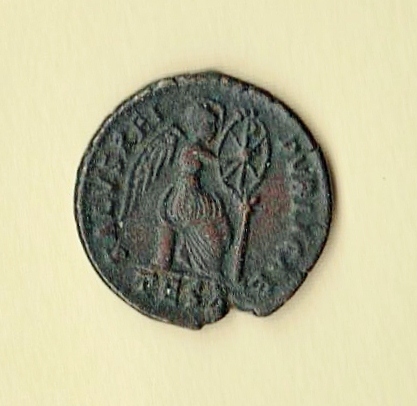 We begin with a bronze Centenionalis of Aelia Flacilla (died AD 386), wife of the Emperor Theodosius I. 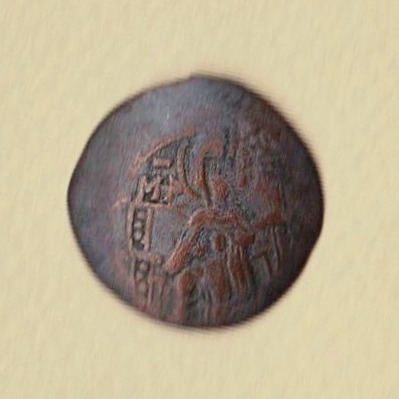 The reverse of this fairly large medium value coin bears an image of the formerly Pagan personification of Victory seated and inscribing a shield with the “Chi-Rho” symbol that had been used by Constantine I, the first Emperor to adopt Christianity some 50 years earlier, as his standard at the Battle of the Milvian Bridge. Despite popular belief the Chi-Rho, formed by combining the Greek capital letters chi and rho to form the sound of the first two letters of Christ’s name, has its roots in Paganism, having been used by much earlier Greek scribes as a means of indicating in the margins of a scroll or manuscript a key passage, abbreviating the Greek word “chreston” (good). This scarce coin is shown in its entirety below, with a link to it on our website. Next is the reverse of a tiny bronze coin of Theodosius II, Emperor from AD 408-450, struck at Constantinople, which had long since replaced Rome itself as hub of the Empire. This is a very early instance of the cross or christogram appearing as the sole decorative device on the reverse of a coin. There is no text to accompany the image, simply a laurel wreath surrounding it (the wreath again conveying much pre-Christian symbolism). 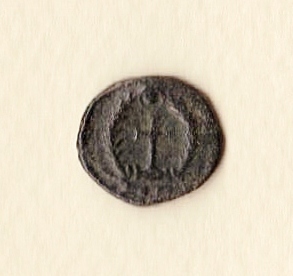 The issuer of this coin, Theodosius II, is perhaps best known for 2 achievements: the Theodosian Code, a compilation of laws issued in the Empire since the time of Constantine I, and building the great land walls of Constantinople, which survived all siege attempts until the final Ottoman assault in 1453. Here is the coin again, showing both obverse and reverse, with a link. Finally, we have a medieval coin of the Byzantine Empire (even at this stage, the Byzantines certainly thought of themselves as Romans), dating to AD 1185-1195, the reign of the Emperor Issac II Angelus, There is little to say about Issac II, other than he was the first of 3 consecutive incompetent rulers whose mismanagement resulted, just 20 years later, in Constantinople falling into the hands of western armies for 50 years, before liberation under dynamic new rulers who helped inspire the final flowering of Byzantine art and culture. There is much to say about the coin. It is made from about 2.5% silver with the rest copper. These poor quality coins, usually very badly struck, were made in great numbers and are today quite affordable. Our example is fairly well struck with relatively clear images. The obverse depicts the Virgin seated and supporting the head of the infant Christ. Unlike Roman coins of the Christian era, Byzantine coins carry the Emperor’s image on the reverse, with purely Christian images or symbols on the obverse. In this case, the emperor is depicted facing, holding an elaborate ceremonial cross and ceremonial clothing rich in Christian symbolism. Here is the coin in its entirety with link. All of these small objects are heavy with symbolism, both Christian and Pagan, and should remind us of how the images and ideas of so long ago have shaped our world today.